Be the first to share your favorite memory, photo or story of LaValia. This memorial page is dedicated for family, friends and future generations to celebrate the life of their loved one. LaValia Iris Abernethy Echols was born to the union of Oswald C. Abernethy and Evelyn Carpenter Abernethy on March 9, 1932 in Denver, CO. She attended public school in Denver and Detroit, MI, graduating from Northern High School. She was united in holy matrimony to F. Bruce Echols on December 31, 1952 who preceded her in death. To this union, two children, Angela and Kevin, were born. She professed her love of Christ at an early age, and attended Greater St. Matthew Baptist Church in Highland Park, MI with her third child, Alva Jean Teasley. She devoted her life to her husband and children. She was an avid card player and loved going to the casino. Her laugh was infectious and she could joke around with the best of them. 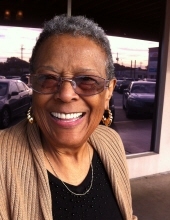 She loved watching Perry Mason and Westers, “boot snatchers.” Later in life, much of her time was spent enjoying the company of her grandchildren, greatgrandchildren and extended Houston family. She leaves to cherish her memory her daughter, Angela Allen; son, Kevin Echols; brothers, Ron (Jenny), Seattle, WA; O. Charles, and Jason Abernethy, Denver, CO; sisters, Ona Jones, Las Vegas, NV, Kathryn Goode, Denver, CO; goddaughter, Alva Jean Teasley, Detroit, MI; grandchildren, Christopher Jackson (Toiya), Atlanta, GA, Kevicha Echols, East Orange, NJ, Matthew Echols (Dana), Ellenwood, GA; godchildren, Toni, Dorin (Detroit, MI) and Darin Teasley, (Reynoldsburg, OH); cousin, Delphine Porter; her dear friend, Maude Lofton; 11 great-grandchildren; one great-great grandchild and a host of other relatives and friends. She was preceded in death by one brother, Rodney Michael Abernethy; and one sister, Claudia Feliciana. To send flowers or a remembrance gift to the family of LaValia Iris Abernethy Echols, please visit our Tribute Store. "Email Address" would like to share the life celebration of LaValia Iris Abernethy Echols. Click on the "link" to go to share a favorite memory or leave a condolence message for the family.